I've made a web tool (http://www.gcodeanalyser.com) to analyze gcode files, and report statistic about the file. The program estimates print time with max speed, acceleration and jerk taking into account, so it's quite accurate. It also reports many other information as well. I think this tool might help you find a balance between speed and quality. I'm very new to web development, so the code is not yet polished under the hood, but I will be optimizing the code and adding new features as a way to learn web development. Let me know what's the estimated print time vs actual print time for you. You should fork the duet web control panel and add this as a tab under the print screen then submit a pull request to have it added into the official release. Good idea, but I need to clean up the code first, it's currently a little too messy. That's a nice tool, have you tried comparing it with Duet simulation mode times? I used it before and it gave accurate time (since it actually run all the code without moving the motors), but it takes quite a while. Thanks for letting me know, I wasn't aware of that command before. 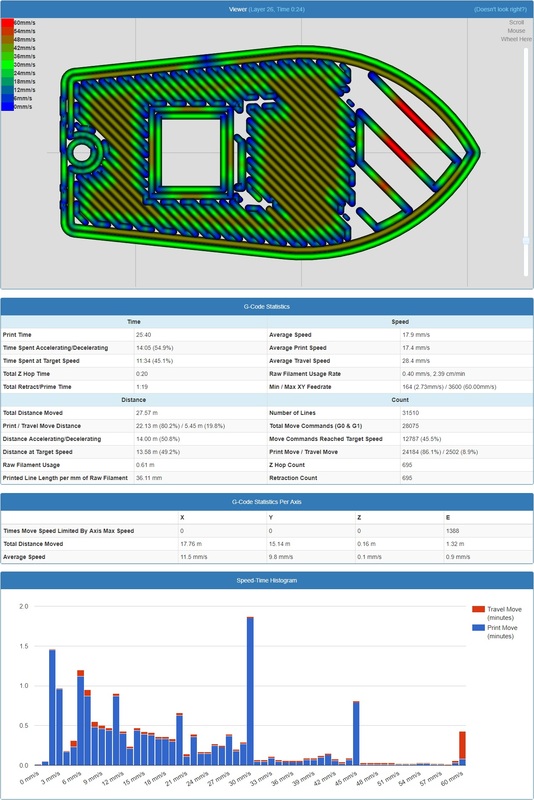 I made comparison, with the same gcode and settings, my duet wifi reports 1 hour 56 minutes, and my website reports 1 hour 55 minutes. It took at least a minute on the duet wifi, but only 1 second with my website. Nice! Does this work properly with a delta, where the drives do not correspond directly to axes? I got 8 hours 4 minutes for something that actually took something like 8 hours 30 minutes, which is much better than Simplify3D's estimates. Having this integrated into the DWC (mainly to fill in the speeds automatically) would be nice. I've been meaning to ask – why are the units for jerk expressed in mm/s? Shouldn't it be mm/s^3? It should work for delta, since the x,y,z acceleration/jerk do not correspond directly to the axis as well. Jerk in 3D printing does not refer to the same thing as in physics. In 3D printing jerk is the maximum allowed instant speed change. With higher jerk values you can take sharper turns without slowing down. This looks really nice! Would you mind if I integrate your analyser in a future web interface version? I think the firmware already provides most of the required values, so that would allow further automatisation. I'd have to redistribute your work under the terms of the GPLv3 though. I wouldn't mind at all, but currently the code quality is not good enough. I just started refactoring the code. Unfortunately this fails for me every time, always with a 'Maximum call stack size exceeded' error. Tried with multiple different gcode files in both Safari and Chrome. "G1 S1 X50 Y50 F5000: FRONT LEFT TO HEAT UP"
You used a colon instead of a semi colon. It's a part of your starting gcode that's why none of your file works. I should have used some kind of gcode error handling, but I haven't got a change to work on it yet. No problem, I just added some simple error handling code that would prevent problems like that. Shen - ran another test today. Your app predicted a print time of 2 hours and 10 seconds. Actual time taken was 2 hours and 14 seconds. Pretty darn good!